These bars are delicious and I plan to make them weekly for breakfast on the go. This recipe comes from my sister, Betsy Leighton. She is a spiritual mentor, mother of 3, and a great cook! 1. Pre-heat oven to 350F. Grease a 9" x 13" pyrex pan. 2. Stir dry ingredients into wet. Press into prepared pan. Betsy's notes: Sometimes I add 1/2 c. walnuts to make it slightly different, because I eat them everyday! 'Fines Herbes' is a classic blend of herbs uses in Mediterranean cuisine. Make it fresh or used dried herbs and store it for future use. Recipe is easily multiplied. What makes this chicken liver mousse so special is its coarse texture and use of very little fat. Most recipes for liver mousse made from cooked chicken livers contain copious amounts of butter or other fats for a moist and creamy texture. This version gets moisture, flavor and texture from onions, shallots and apple. For best results, do not overcook the chicken livers, which should be pink on the interior. Serve with mustard and crackers or toasted bread. Heat oil in a large heavy nonstick skillet over medium heat. Add chicken livers and sprinkle with 1/4 teaspoon each salt and pepper and a pinch of nutmeg. Cook until beginning to brown on the bottom, 3 to 5 minutes. Turn over using tongs and sprinkle with another 1/4 teaspoon each salt and pepper and pinch of nutmeg. Cook until the livers are firm to the touch and pink on the inside when cut into, about 3 minutes more. Transfer to a bowl with the tongs (leave any remaining oil in the pan), cover and refrigerate for at least 30 minutes or up to 1 hour. Meanwhile, add onions, shallots and garlic to the pan. Sprinkle with 1/4 teaspoon each salt and pepper. Cover and cook over medium heat, stirring occasionally, until browning and beginning to soften, 8 to 10 minutes. Stir in apple, brandy, sage and thyme and scrape up any browned bits. Cover and continue cooking, stirring frequently, until the onions are very soft and the apple is beginning to break down, 6 to 8 minutes more. Transfer the mixture to a shallow bowl and refrigerate for 30 minutes. Spoon the cooled livers and any juices into a food processor; pulse several times until the livers are coarsely chopped (individual pieces should be about 1/4 inch). Using a rubber spatula, scrape the mixture into a medium bowl. Add the onion mixture to the food processor and pulse to coarsely chop until it resembles cooked oatmeal. Transfer to the bowl and stir the liver and onions to form a lumpy, homogenous paste. Season with 1/4 teaspoon each salt and pepper, or more to taste. Spoon the liver mousse into a deep bowl just large enough to hold it. Press plastic wrap directly onto the surface and refrigerate for at least 1 hour. Note: Look for fresh chicken livers that have not been previously frozen. Previously frozen livers exude more liquid when cooking so they don’t brown properly, which results in watery, less pleasant texture for the mousse. Per 1/4-cup serving: 102 calories; 4 g fat (1 g sat, 2 g mono); 130 mg cholesterol; 6 g carbohydrates; 0 g added sugars; 7 g protein; 1 g fiber; 223 mg sodium; 171 mg potassium. In a mixing bowl or in the bowl of a stand mixer, combine the seeds, flour, salt, honey and vegetable oil with three-fourths cup water. Mix by hand or in a stand mixer with a paddle attachment to form a firm ball of dough. It should not be sticky. On a lightly-floured surface, knead the dough by hand for about 30 seconds to make sure all the ingredients are evenly distributed and that the dough holds together. It should be slightly tacky but not sticky. Add more whole-wheat flour or water, if needed. Heat the oven to 300 degrees. Line three baking pans with parchment or a silicone baking liner. Divide the dough into three equal pieces. Set two of the pieces aside and roll out the remaining piece on a floured surface with a floured rolling pin. Roll it to less than one-eighth-inch thick, or nearly paper thin. Continually lift the dough as you roll it so that it doesn't stick to the surface; dust more flour under it if need be. You can also flip the dough over and continue rolling with the bottom side up. If the dough resists, lift it gently and set it aside and begin rolling out one of the other pieces. You can return to the first piece after a few minutes and it will roll more easily. Continue rolling out all three pieces in this manner. Use a knife or pizza cutter to cut the rolled dough into rectangular or diamond-shaped crackers. (You can also use a small biscuit cutter, dipped in flour, to make round crackers.) The crackers do not need to be the same size. Carefully transfer the cut crackers to the baking pans. The pieces can be nearly touching, as the crackers will not spread or rise. Fill each pan as full as it will allow. Combine the egg with one-half cup water. Brush the egg wash lightly over each of the crackers and top with sesame seeds. 7. If your oven has enough shelves to accommodate all the pans, you can bake them all at once. If not, bake them in shifts. After placing the pans in the oven, bake for 10 minutes. Rotate the pans and bake for another 10 minutes. Make one final rotation and continue baking until they are done. (The thinner you roll them the faster they will bake -- they typically take about 25 to 30 minutes total, but this can vary from oven to oven.) The crackers will be a rich golden brown and should be fairly dry and crisp when they come out of the oven. Leave them on the pans to cool; they will crisp up even more. If they do not snap cleanly after they cool, return the pan to the hot oven for a few more minutes. The crackers can be stored in an airtight container or resealable plastic bag and kept for at least 8 days at room temperature or indefinitely in the freezer. Each of 6 dozen crackers: 32 calories; 1 gram protein; 4 grams carbohydrates; 1 gram fiber; 2 grams fat; 0 grams saturated fat; 3 mg. cholesterol; 26 mg. sodium. Note: Adapted from "Whole Grain Breads: New Techniques, Extraordinary Flavor"
In a mixing bowl, mix the salt with the flour. In a separate bowl, combine the milk, honey (or agave) and oil. Pour this into the flour mixture and stir with a large spoon until the dough forms a ball and all the flour is absorbed. The dough will be very soft. Knead the dough for a few minutes on a well-floured surface, adding more flour as needed until the dough forms a smooth ball and feels soft and supple but not sticky, like modeling clay. Heat the oven to just below 300 degrees. Line three baking pans with baking parchment or a silicone baking pad. Divide the dough into three pieces and form each into a ball. Set two of the dough balls aside and roll out the third. Dust the counter with flour and also the top of the dough, pressing it with your hand to flatten it. Use a straight rolling pin (not a tapered pin) to work the dough to a thin oval or rectangle less than one-eighth-inch thick. Every few seconds lift the dough and dust under it with more flour and dust the top as needed to prevent the dough from sticking to the counter or the pin. If the dough resists and shrinks back, let it rest for a few minutes and move on to one of the remaining dough balls. Repeat the rolling process with each piece of dough. Combine the egg with one-half cup water to make an egg wash. Brush the top of the dough with egg wash and lightly sprinkle with coarse sea salt. Cut the dough into desired size for crackers with a pizza cutter or with a knife or pastry blade (you can also use a small biscuit cutter). Transfer the crackers to the pans, placing them very close together (they will not rise or spread). Place the pans in the oven (you can bake them all at once or one at a time). Rotate the pans after 8 minutes (if baking multiple pans, switch shelves). After another 8 minutes, rotate again. Bake an additional 6 to 8 minutes until toasted and light golden-brown, 22 to 24 minutes total. If not brown, increase the temperature by 25 degrees and continue baking until the crackers are golden brown and stiff, not flexible. Remove from the oven and leave on the pan until cool and crisp. This is great as an appetizer with tortilla chips, as a side dish, or as a topping for grilled ahi tuna steaks. Mix ingredients together and allow to sit for 15-30 minutes to allow flavors to meld. Serve. I burnt the first batch of this, so I am going to try making it again. It looked so good going into the oven, too! Remember to stir it every 15 minutes while it is baking - this will help you remember it is in your oven. Preheat oven to 350F 300F degrees. Combine syrup or honey, oil and vanilla and heat until warm, stirring to blend. Add liquid to dry ingredients and stir to combine. Place on a large, rimmed sheet pan. Bake for 45 minutes - stirring every 15 minutes to prevent burning. Remove from oven and cool mixture. Stir in cranberries and dates. Store in an airtight container. 356 calories; 10g protein; 38g carbohydrates; 7g fiber; 12g total fat (3g sat, 4g mono, 11mg poly); 7mg sodium. This is a very easy, neutral side dish that goes with a lot of entrees. Israeli couscous grains are much larger than traditional couscous, making it fun to eat. Add couscous, oil and salt. Stir to combine. Simmer for 10 to 12 minutes or until tender to the bite. Drain and cool to room temperature. Pre-heat grill pan to medium-high. 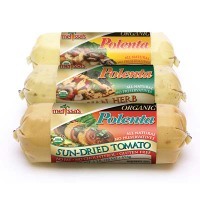 Remove polenta from package and slice into 8 slices of uniform thickness. Brush each side with a little olive oil or spray with non-stick spray. Season with salt and pepper. Grill for 7 to 10 minutes per side, or until brown grill marks appear. Paneer is a soft farmer cheese that is very common in India. We have had it many times in Indian dishes when dining out, but I wanted to try my hand at making it myself at home. Unlike many cheeses, Paneer does not require any special equipment, nor special ingredients (such as rennet). All you need is milk, and lime juice - which acts as an acid to separate the milk solids from the whey. You will also need a heavy pot, wooden or heatproof spoon, strainer or colander, cheesecloth, and twine. Place the milk in a heavy pot over medium heat, stirring occasionally to prevent milk from burning on the bottom of the pot. Once the milk barely starts to boil, reduce the heat to low and add the lime juice, stirring constantly. After a few minutes, you will see small curds like white clouds floating on top. Wait until they get bigger (if they don’t, add some more lime juice and stir) and the whey below gets less milky. Wait at least five minutes from this point. Turn off heat and let stand for few more minutes. Place a strainer into the sink and line the strainer with 3 layers of clean, damp cheesecloth so it drapes over the edges. Pour the mixture into the cheesecloth/strainer, allowing the whey to drain off. Gather up the edges of the cheesecloth and tie a knot a couple inches above the curds (or use a hair binder to secure the bundle). Hang the bundle over the sink and allow the whey to drip for 30 minutes. Untie the bundle and twist the cloth several times to tighten, squeezing out any remaining whey. Re-tie the bundle, this time more tightly with the knot just above the paneer. Continue hanging for another 30 minutes. Remove the paneer from the cheesecloth; it should be a firm ball. Chill it in the refrigerator for at least 2 to 3 hours to firm up. Paneer is a central ingredient in Indian curries, Palak Paneer and Matar Paneer. It is usually browned in a little oil before being added to a recipe. Recipe adapted from one by Mahanandi. Sift together flour, salt and sugar. Cut in shortening until crumbly consistency. Gradually add a little water at a time, mixing gently until the dough holds together. You may not need all the water. Do not overmix, and do not add too much water. Cover dough with plastic wrap and refrigerate at least 30 minutes before using.